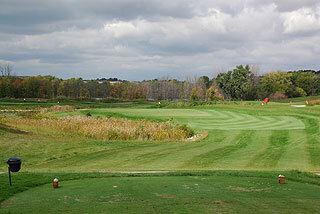 The Birck Boilermaker Golf Complex includes complete practice facilities including a targeted outdoor range with both grass and artificial playing surfaces. There are putting greens plus a short game area with sand bunkers. The adjacent Tom Spurgeon Golf Training Center has indoor hitting bays and a putting green, and is home to the Purdue University Teams. The clubhouse features a golf shop stocked with some of the latest equipment and demo clubs. There also is a snack bar/lounge serving beverages and sandwiches. On course yardage markers are provided at 100, 150 and 200 yards (250 on par fives) on the fairways and cart paths, and color coded flags indicate front, middle and back hole locations. The Kampen Course is a links style layout that is demanding both in length and in the variety of shots that are called for. 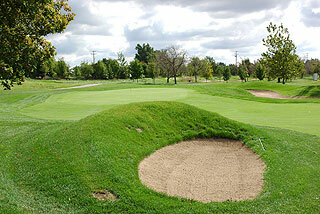 Waste bunkers, preserved natural areas and wetlands, sand traps, ponds and tall native grasses all contribute to the aesthetics and to the difficulty of a round here. 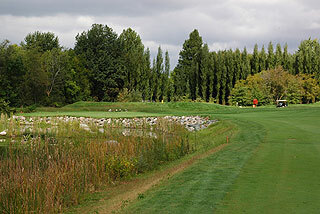 The course has hosted numerous prestigious events including: 1999 Women's and 2000 Men's Big Ten Championships, 2000 Western Junior Championship, 2001 Women's and 2004 Men's NCAA Regional, 2003 Women's NCAA Championship, 2004 Indiana State Open, 2005 Women's western Amateur, 2005 B I Classic and the upcoming 2008 Men's NCAA Championship! 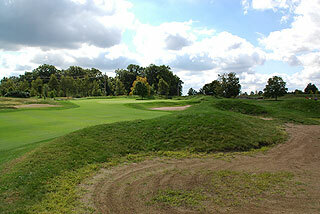 Construction of the course began in 1996, with Pete Dye employing the aid of 32 Purdue students. The Departments of Forestry, Entomology, Water Quality Testing and Argonomy were all involved in the planning. 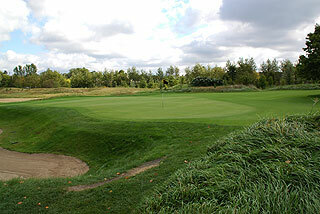 The result is a unique design that compliments the landscape and the environment, while providing a track that has been ranked the second toughest course in Indiana and # 8 in collegiate facilities in the country. 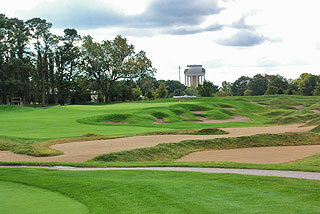 Water affects shots on seven holes, and 52 soft sand bunkers come into play along the fairways or greenside. Sand is a dominant feature, as there is an abundance of intricately designed waste bunkers that help to define the landing zones along the wonderfully manicured fairways. The fescue surrounding the sculpted tee areas and in the mounding and sides of sand traps near the putting complexes is thick and gnarly, presenting nearly impossible recovery situations. The visual effect smacks of an Irish links setting. The fairways are mildly rolling with sparse tree cover and the undulating greens are medium in size, but well protected by sand, mounding, swales and collection areas. There generally is ample room for recoveries from errant approaches, but a good short game featuring shots varying from bump and run chips and pitches to high arcing lobs is necessary to score well here. From the tee, length and accuracy are equally important. 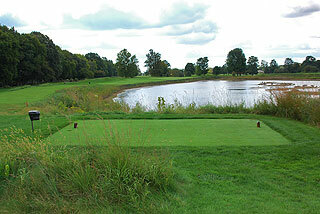 Golfers will find and interesting but challenging round on the Kampen. Four sets of tees play to distances and slope measuring 7382 yards/145 slope, 6646 yards/138 slope, 6112 yards/128 slope for men and 129 for women, and 5224 yards with a slope of 115 for men and 117 for women playing from the forward sets. 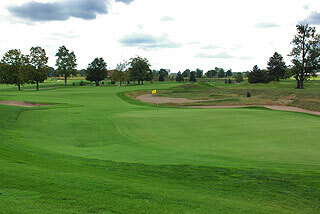 Pete Dye considers this to be one of the finest University courses in the country...we agree - highly recommended! There are special rates for faculty, alumni and students, and walking is allowed at all times. With two courses and the very fine facilities, the Birck Boilermaker Complex is a great venue for outings and corporate events. For more info, visit our page for the property, with direct link to their website by clicking here.